Today I did my first 9A Guilty Perpetua (FA), which is a link-up in the 'Old Skool' Disblia cave. 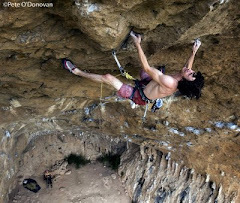 It links Guilty, a hard 3 bolt 8b+ (font 8a at least) into the top of Cadena Perpetua. Cadena perpetua is a hard 8c that I have already done, the top section being 8b+ in its own right. I dont really like breaking down the route into graded sections because when comparing them to other routes there are so many varients to be considered i.e. the size of rests etc. Regardless, this is my hardest route to date and the most direct line through this awesome cave and im really psyched for people to come and try it and give their opinions.